Turn Three at the Buddh International Circuit is a place I'd rather never pass through. It climbs up steeply blocking your view. And at the crest it throws a sharp right that leads to the long back straight. It's an important corner to get right because it impacts the lap hugely if you do not. But I've always had this immense dislike for the turn from the very beginning. And yet, on the Suzuki GSX-S750, my knee is firmly on tarmac, peg feelers as long as my fingers (no, really), are also on the ground. And I'm hard on the gas, unworried. 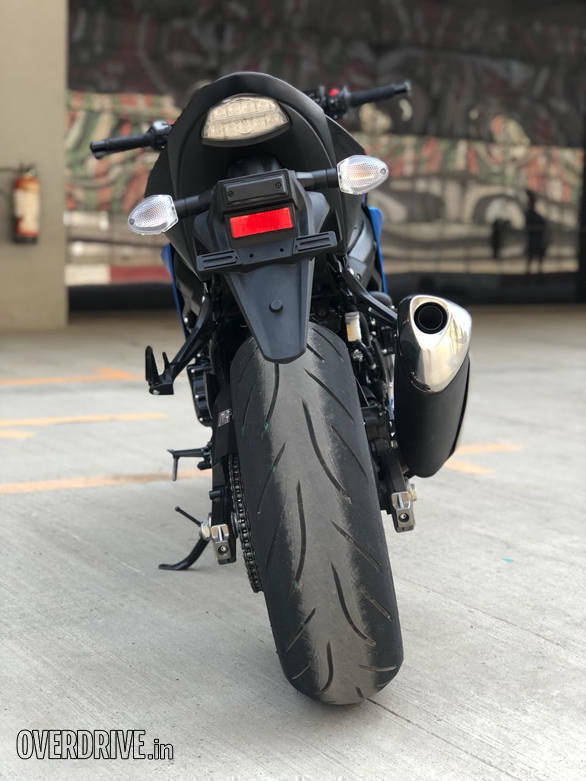 The Suzuki GSX-S750's traction control light might be on or not. I sense nothing amiss and I am able to nail the gas. Get it right and it's nearly 230kmph into the next turn at the end of that straight with arms, neck and shoulders aching from the windblast. Shall we continue or back the truck up a bit? Let's start at the very beginning, I'm reliably told it's a great place to start. 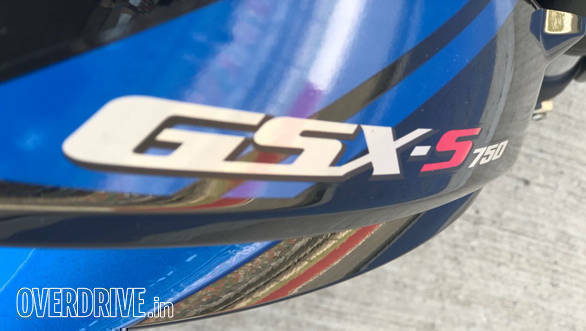 The GSX-S750 replaces the old GSR750 and uses the same formula as the GSX-S1000. And no surprise, the essence of the design is the same too. So the overt shapes at the leading edge of the tank, a complex headlamp fairing et al is par for the course. The back-end is relatively compact and simple. I like it. I still think Suzuki can make the headlamp shape better but I already think the S750 is a better-looking motorcycle. 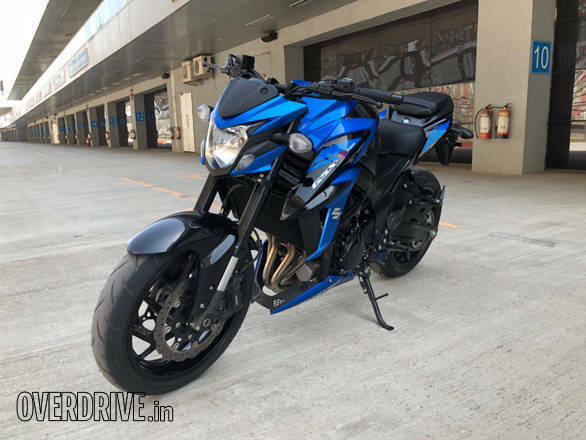 The Suzuki GSX-S750 derives its engine from the K5 R750 and that's a great start. 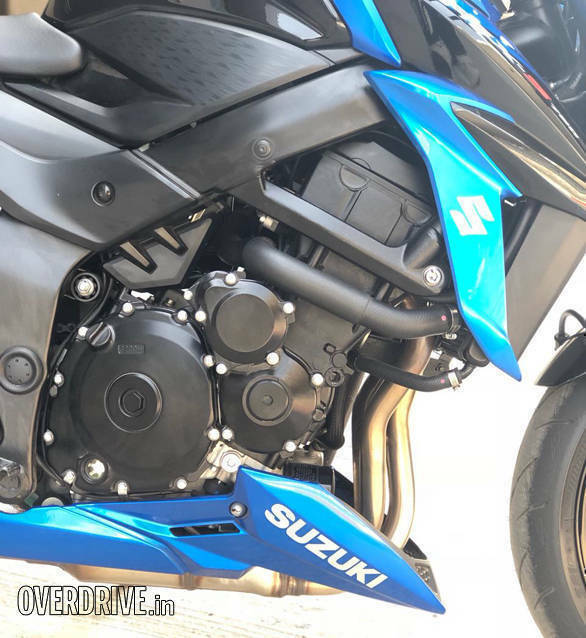 The engine has been tuned for torque and Suzuki's other updates include crankcase ventilation to save pumping losses, new injectors and an updated airbox. The result is an engine that makes 7PS more than the GSR750 at 114PS at 10,500rpm. Peak torque is higher too, 81Nm at 9,000rpm. On the move though, you only feel a linear wave of power that builds to the redline. It's not urgent or frantic power though. This is smooth, predictable, even friendly power. For new riders, this is perfect. It means you're more likely to enjoy it rather than be threatened by it. The sole surprise is that right at the bottom, the fuel injection can produce a little jerk as you go from a closed throttle to an opening one. Keep it pinned and there's an old-school chattery redline which I also enjoyed ramming into here and there. 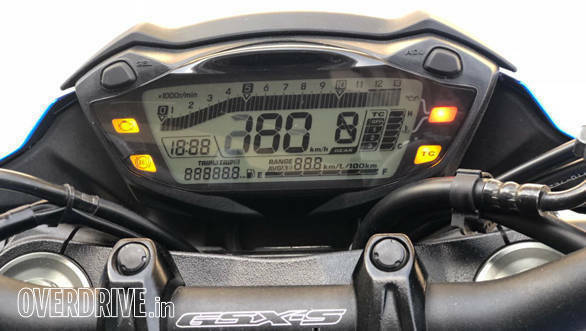 For a brand-new motorcycle, the gearbox felt slick enough and the general refinement level of the GSX-S750 is actually extremely good. All that performance is backed by a well-rounded four-cylinder howl that's stunning to listen to. And it's just as thrilling whether you're on board listening to the intake roar, or standing beside the road hearing that inline four sing its lusty song. Nearing redline, it has the sweetest howl and I cannot imagine you will ever think of swapping the stock can for anything else. We have always called Suzuki out for offering rubber brake hoses on bikes this fast. But the GSX-S750 has solid brakes. The 310mm Nissin floating discs, standard ABS and radially mounted calipers all add up. 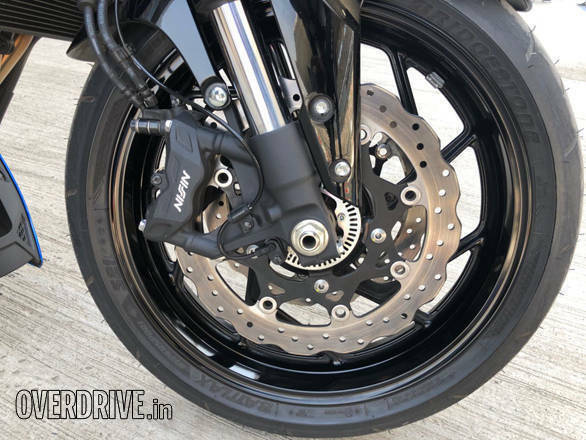 The brake bite is nice and strong and slowing the S750, even from 230kmph is not a lot of hard work. Handling is similar - it's easy. The GSX-S750 goes precisely where you point it. There's no surprises here. Turn in is easy to get used to, it's stable mid-corner like a rock and it comes out flying allowing traction control to smoothly control things if needed. At 215kg, the S750 is not the lightest motorcycle in its class to be sure, but you only feel the weight in side-to-side transitions. Only in the chicanes do you feel like you're putting in an effort to steer and turn the bike. On the flip side, the easy steering and the high-lean stability create a forgiving motorcycle. You can make mistakes and recover from them even at a fair click. The BIC has a fair few corners where you need to spend time to find the lines and the S750 doesn't mind the wandering about or hesitation and corrections as you sort yourself out. The Suzuki GSX-S750 has standard ABS in addition to traction control. The latter has three modes - 3 for wet and slippery, 2 for most things and 1 for sporty riding including some slides and wheelspin. The beauty of the Suzuki system is that selecting and changing modes on the fly is dead simple. And the interventions from the system are almost completely invisible. It really feels good until you realise how often - for instance in Mode 3 - the TC light flashes silently at you. 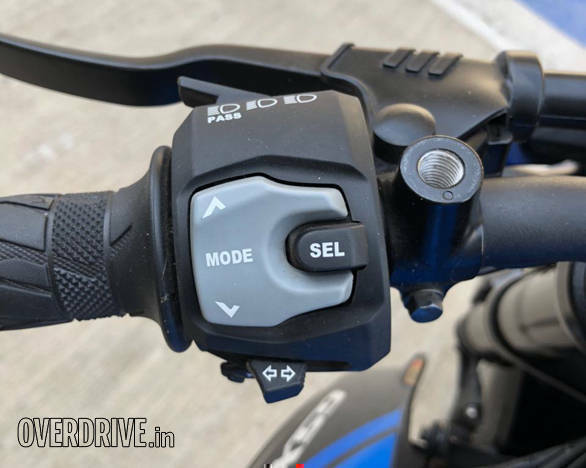 The left switch cluster on the 2018 Suzuki GSX-S750 is extremely familiar and so easy to use! At any time, you press the SEL button to indicate you want to change modes, arrow keys to select a new mode and SEL to confirm. On the fly too! 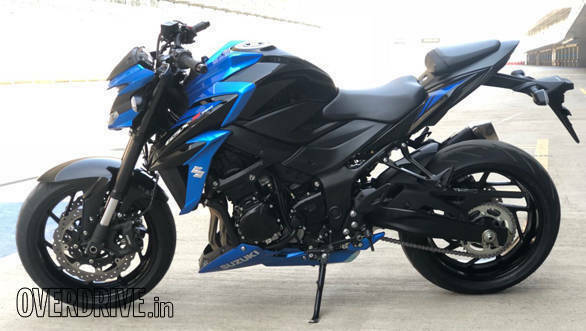 I am in two minds about the Suzuki GSX-S750. This is an undemanding motorcycle in most ways you can think of. It's easy to ride, easy to steer and as a Suzuki, it will be easy to live with also. But the performance is real. It screams out of the corners, 230kmph at the back straight is nothing to scoff at and my laps were fast and smooth without major effort on my part. That's perfect for new riders, right? 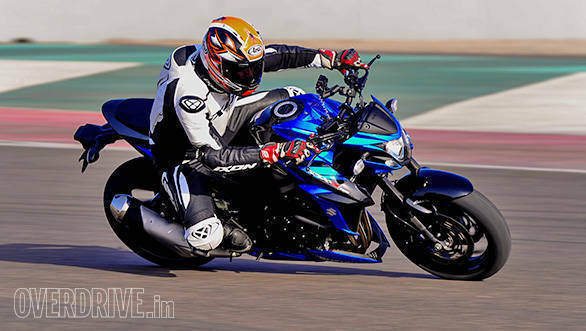 The Suzuki GSX-S750 is easy to recommend in that context. It's smooth, has that noise we all want and it's utterly predictable and trustworthy. And at Rs 7.45 lakh ex-Delhi, it is well priced too. In comparison to its British and Japanese peers, though, the competition is tighter. The Suzuki is the heaviest of the three and not the most powerful either. I think that means a solid comparison test more than anything else, right? 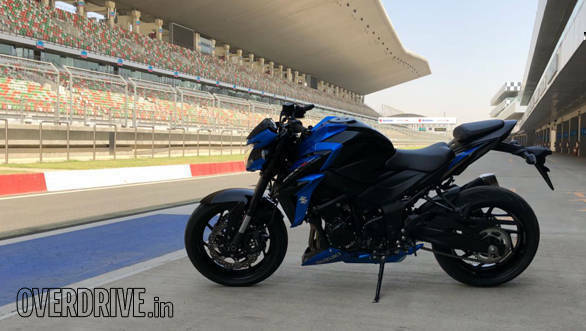 So that is the story of the Suzuki GSX-S750. We cannot wait to ride it in the real world. I think it will be a slick little urban machine as well as a decent to great highway bike once you add a little screen. If you're a new rider upgrading to your first serious performance bike, just north of 100PS is a good place to aim for - it's a big step but the bike will keep up with you for a few years as you grow in skill and confidence. And that's the word I was looking for. 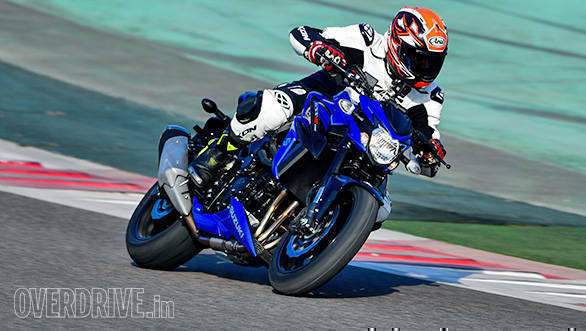 The Suzuki GSX-S750 comes across as a little too quiet and well-mannered at the racetrack. It lacks drama. And then you realise that it doesn't. It makes you - and that's the crucial bit - so confident that you're pushing harder than you ever have before and wondering where the drama went. Nicely done, Suzuki! 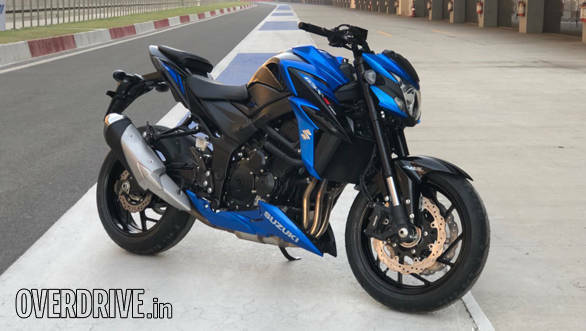 What's under the new Suzuki GSX-S750's skin?